I’ve not done a lot of blogging recently.. With the last post on my OLD blog being from 2010. While WordPress did work well so far on Azure Web Sites / Web Apps, the big painpoint so far had been DATABASE support.. WordPress being a PHP application, it’s Data Access Layer had been written to target MYSQL. Now FINALLY we do have a version of WordPress (again) that works with SQL Server and Azure SQL DB. You can go and download it from http://projectnami.org/. Setting it up is somewhat bumpy, because some files are missing, some I had to do a few undocumented steps. When I first tried WordPress it failed unexpectedly, which was to do the .JS files missing – and me getting 404. Solution is to copy the files – e.g. widget.min.js –-> widget.js. This way WordPress will then get the URLs right and work. Next create a new Azure Web App in the new portal. Create a new Azure SQL Database (ideally in the same Resource Group as the Web App). Use Pricing Tier S0 or higher. Now I’m using GIT to deploy the locally changed sources into the Azure WebApp. Click on the WebApp and pick “Continuous Deployment” under Settings to configure the GIT Endpoint for your WebApp. Pick “Local Git Repository” as the source. Configure username and password for the GIT endpoint created. 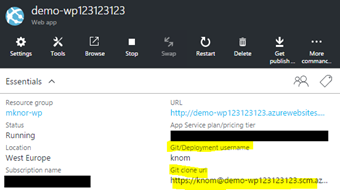 Go back to the main blade of your WebApp and copy the GIT Clone URL. Open the folder where you previously extracted ProjectNami WordPress in Commandline. User Name, Password = What you configured just a minute ago. Could you please give me some more information on the missing JS files? I looked at both our repo and the release you mentioned, and within the JS folders for wp-admin and wp-includes, and I didn’t notice anything missing right off. For example, both widgets.js and widgets.min.js are present. When I first ran project nami, the wordpress site did behave strangely.. Checking the dev console I found a lot of 404s all for JS files.. Same was true for the ZIP file with the release.. Interesting, those are jQuery files and not WP itself. Seems those files are missing in WP Core as well. Have you seen the same issue with standard WordPress? I haven’t installed standard WordPress..
I’m not familiar with WordPress code base, but maybe there’s a way to force minified files.. Very cool, thx for the step-by-step guide, Max!